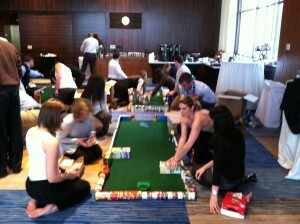 Neuronetics recently included an Ace Race team building workshop in their annual Sales Conference in Philadelphia, PA. The workshop involved 40 of their salespeople from all over the US. Neuronetics, Inc. is a privately held medical device company focused on developing non-invasive therapies for psychiatric and neurological disorders using MRI-strength magnetic field pulses. The company incorporated in 2003 and works around the country. 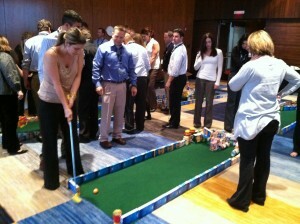 This event was for their sales force and involved about 40 people. The Ace Race team building event began with a couple of quick warm-up activities that get at some of the fundamentals of good team communication. The group shared a lot of laughs and the competitive spirit was high! Moving into the golf team activity itself, each small group created a mini putting green for themselves using non-perishable goods. Each green had a unique design and some included very tricky obstacles! All of the teams then had a race to see which team could get around the entire course first, making a hole-in-one on each hole. Sales people tend to be fairly high-energy as it is, and this group was no exception! There was a lot of laughter and cheering as they created and then played their course. At the end of the event, they invited Philabundance, a local hunger relief organization that serves nine counties in the Delaware Valley and is connected to the national organization, Feeding America. A representative from Philabundance came to the event and spoke to the group about their work and the impact that the donation of nearly a quarter-ton of food will have in their communities. Team building workshops that are composed of activities that have a point, coupled with a lot of fun and the opportunity to give back to the community are a great way to get people having fun together. Consider including an Ace Race Golf Team Building Event in your next conference and give your team a memorable experience!